I am very excited to announce that last Saturday the Deseret News published a book review of The Crystal Realm: Krytor’s Return! “Krytor’s Return” the first book in the Crystal Realm trilogy by LDS author C.J. Ballantyne, is an engaging, fast-paced fantasy novel based on Christian concepts and beliefs. Just a heads-up for a giveaway! 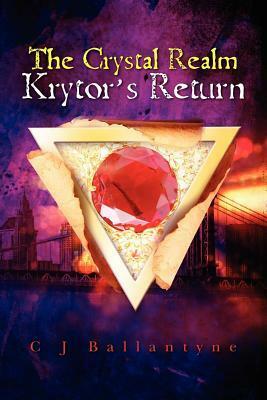 For those of you who know about Goodreads, I have listed a giveaway of 3 signed copies of ‘The Crystal Realm Krytor’s Return’ starting 1st July through to the 7th July. For those of you who don’t know about Goodreads, it’s a fantastic site for people who love to read books. Check it out! Goodreads has more than 3 million members and is the largest social network for readers. If you are an author, Goodreads provides an opportunity to reach readers who haven’t yet heard of you, and connect you more deeply with those who have. You can start a blog, list giveaways (like I have done), connect with new friends, post updates for new and upcoming books, and hopefully you may get some new fans who want to follow you. If you love reading and all things books then Goodreads is where you’ll find the deepest concentration of confirmed book addicts looking for the next great read. Joining is free and you can go there to catch the latest book-news gossip; join groups and discussions focused on your favorite genres; post reviews; vote for the best book covers, book titles and a myriad of other topics; and generally find enough to do to satisfy all your book lovin’ needs. It’s all about social networking, making new friends, and finding great books to read and share. Well, it’s May and Brenda Novak’s Online Auction to help find the cure for Diabetes is now live. Already, thousands of people have placed their bid for the items they hope to win at this amazing auction. Go over to her site and place your bid to support Diabetes research. People have already begun to bid for the Crystal Realm Krytor’s Return, so keep those bids coming in and let’s see if we can help break the $2 million donation mark Brenda is trying to reach this year. I received an email from Brenda yesterday and the auction has already made $77,000. I’m thrilled to announce that the auction has already broken all previous records for amount raised in the first two days. Yesterday, we reached $77,000!! That is simply incredible, and it’s thanks to all of you. Thank you from the bottom of my heart and I hope you enjoy the story of my handsome pirate captain Nathaniel. Brenda’s book special will only last 48 hours – so be quick if you want a good read. Wordstorm 2012 is the Festival of Australasian Writing and national poetry festival held in Darwin from May 10th – May 13th. Come and visit the tsunami that is WordStorm 2012! Four days of indulging your senses with writing in all it’s marvelous forms. Those who fancy visiting Darwin won’t regret joining in with all the litery fun at WordStorm. For locals, it’s a must see event. There will be a glut of guests offering all things literary – plunging you deep into everything the festival has to offer, including literary dinners with well-known authors; comedy debates; workshops; master classes; panels; book readings and launchies; live music and caberets; poetry slams; and digital poetry. This year the National Year of Reading and WordStorm will showcase the best writers and poets the Northern Tettiroty has to offer. The winners of the Territory Read Competition and Territory Literary Awards will be announced on the opening night, May 10 between 5.30pm – 7.30pm in the Main Hall, Parliament House (invitation only). Chris will be part of a panel discussing other worlds and fanatasy writing, between 10.30 am – 12 midday on the 12 May in the Browns Mart Theatre. He will be joining Allison Croggon (The Books of Pellinor) and Sophie Constable (short story fiction writer). Immediately following the panel, Chris will attend a book signing at the Dymocks Festival Bookshop where his books will be available for purchase. So come along and say hello! If you want to have a great old literary hoedown and would like a signed copy of ‘The Crystal Realm Krytor’s Return’, head on down to WordStorm. Look forward to seeing you there! Some of the famous faces include: William McInnes, Judith Lucy, Henry Reynolds, Marieke Hardy, Peter Fitzsimons, Marie Munkara, Rod Moss and Chris Wallace-Crabbe. WordStorm 2012 – Literarily the most fun you’ll have all year. Chris will be donating two signed copies of his book The Crystal Realm – Krytor’s Return to Brenda Novak’s Annual Auction: For The Cure Of Diabetes. This is a for a great cause! If you wish to get involved or donate something, click on the link. City of Darwin Libraries are pleased to announce a new monthly social morning for Seniors at Karama Library. The group will meet on the third Friday between 10am and 12noon, the first being 23 March. Each month special guests will be invited to speak and/or entertain. This month we are looking forward to author Chris Ballantyne joining us with lots of valuable information on writing and self publishing. Meet new friends and renew old acquaintances over a cup of tea at Karama Library – it’s all free. Phone 8927 2505 or register online. We look forward to seeing you! To Self Publish Or Not To Self Publish, That Is The Question! In coining a phrase from the great bard, I believe this is the most pertinent question on the mind of most writers. With the decline in traditional publishing and the poor economic climate, the chances of a new author gaining a contract from a traditional publisher is slim. Conversely, with the advent of Print on Demand (POD) technology, the opportunity to self publish has never been greater. I faced the self publishing decision after three years of hard work writing my manuscript, “The Crystal Realm Krytor’s Return.” After sending my manuscript to traditional publishers and agents I received the well-known polite rejection letter. Many of these letters were not form letters, but personal replies, and indicated that although my manuscript was good, the publisher could not take the risk in these economic times. What percentage of submissions you receive make it to publication? The conventional wisdom is that one in a thousand manuscripts is publishable. Actually, I feel this number is closer to one in a few thousand. These days it is extremely hard to break in a new writer. Book distribution is controlled by big companies which are much more reluctant to take on new unknown authors compared to previously established ones. A new author has to be extremely, extremely good to make it through the process. What are the trends in book publishing right now? Book publishing is definitely on the decline. Readers – and writers – tend to spend more time on the Internet. In fact, I could think of several writers who nearly stopped writing – haven’t produced any new books in a year or two – because they spend their time on some on-line games. There are just more things to do out there for creative people than before, and books are sliding down the list. Doesn’t really matter. I definitely wouldn’t hold it against them. In fact, I think that in the current competitive environment self-publishing is a good idea – simply because you can do it. I never realized before how many people are trying to write books. The vast majority of them will never be commercially successful. But if you self-publish, you can sell to friends, and the few people who happen to enjoy your writing, and this way you can at least reach somebody. Self-publishing may be an even better idea for those authors I mentioned whose writing is solid, and who would have been successful 20-30 years ago but cannot breakthrough in the current markets. If these authors can reach their audiences with self-published books, they could potentially make pretty good sales. There is always a small number of self-published books that make it in a big way. In addition to everything else, Internet is now providing unprecedented possibilities to advertise yourself, making it easier for anyone to self-promote. An average person can easily reach thousands of people, in some cases this is all any author can hope for even with traditional publishing. And if you can sell thousands of copies of your self-published book, it can really serve to your advantage in finding a big publisher for your next work. Stampfel’s comments created an excitement in my mind that I couldn’t quell. I decided to self publish and, as they say, the rest is history. My book was published in September 2011 through CreateSpace and is available on Amazon as a paperback book and as an e-book on Kindle. I am having a positive response in both sales and comments by those who have purchased and read my book. Although this is not the time to elaborate about the publishing process, I found that CreateSpace were exceptionally good to work with and were always available to answer any of my questions. So, my recommendations regarding self publishing – don’t hesitate! It can be a lot of work as you have to do everything yourself (unless you want to pay for services, which can become costly), but if you are willing to put in the effort, you can publish a book for little or no cost (depending on the POD publisher). Be aware though, everything means everything: formatting; editing; front and back covers; blurb; marketing; website and much more. But it’s worth it. And don’t forget about the support of your local community. I have had many kind and wonderful people who have gotten behind me and supported The Crystal Realm. Thank you everyone!